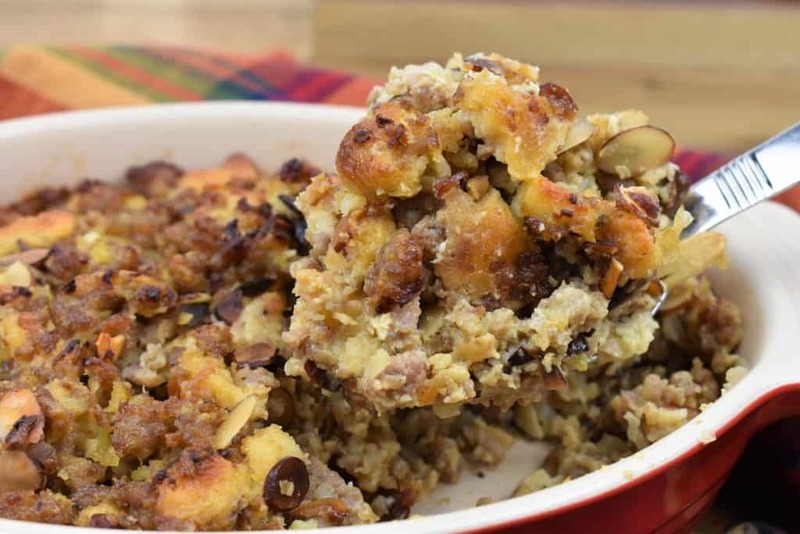 This sausage stuffing is a family favorite. It’s really easy to make and uses simple ingredients. In this recipe, flavorful sausage, toasted almonds, vegetables and bread are combined to make the best stuffing. Now, we don’t actually stuff the turkey, instead we make the stuffing in a casserole dish and serve it as a side dish. 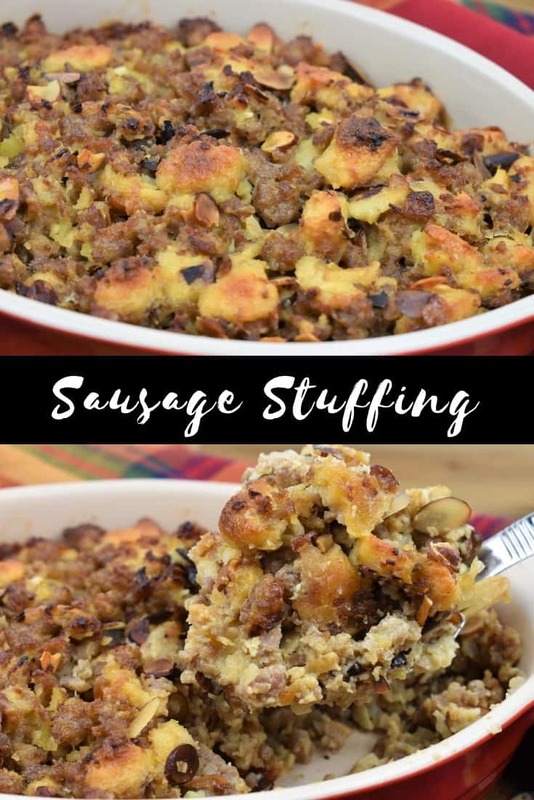 My family really loves this sausage stuffing, I hope yours does too. And if you need more classic side dishes, try these perfect mashed potatoes, a creamy broccoli and cheese casserole, or these green beans & bacon. Enjoy! 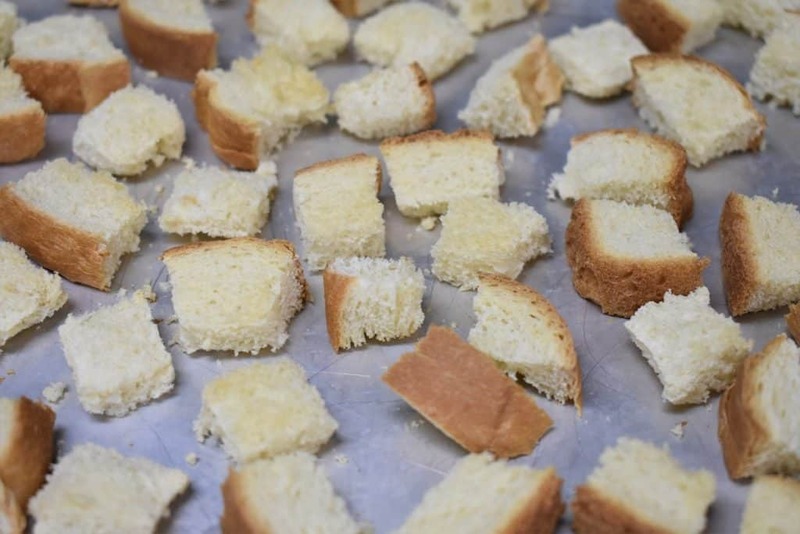 Cut the bread into roughly 1 inch cubes. Arrange them on a large baking sheet. Bake the bread for 7-8 minutes until it’s lightly toasted. Place the almonds in a non-stick skillet over medium heat; cook gently for about 5-6 minutes until they’re golden. Shake the skillet often and keep an eye on the sliced almonds so they don’t burn. Remove the skillet from the heat. If you’re using sausage links, remove the casings. Tear the sausage into small pieces. This will make it much easier to break up the sausage once it hits the skillet. Heat the olive oil in a large skillet over medium heat; add the onions and celery. Cook gently for 5 minutes until the onions are translucent, stirring frequently. Add the garlic, cook for 1 minute, stirring frequently. Raise the heat to medium-high and add the sausage. Cook, about 5 minutes to brown the sausage, stirring frequently and breaking up any large pieces with a wooden spoon or spatula. Lower the heat to medium-low and add the sliced almonds, stir to combine. Continue cooking for 3-4 minutes while stirring. Remove the sausage mixture from the heat. You will need to handle it with your hands, so let it cool down. Stir the sausage once in a while to allow the steam to escape, it will cool quicker. 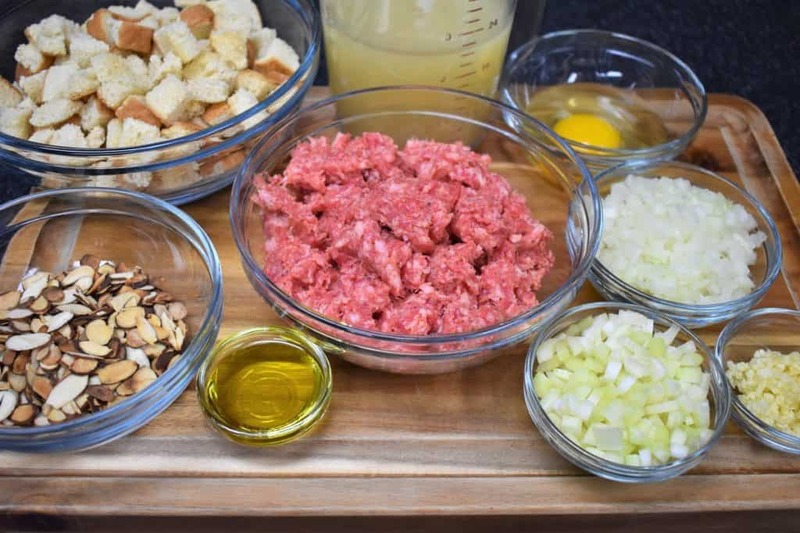 To a large bowl, add the sausage mixture, toasted bread cubes, a slightly beaten egg and a pinch of salt. Slowly add in the chicken broth while combining using your hands. Continue to add chicken broth until the bread crumbs are moist all the way through. Continue mixing until all of the ingredients are well incorporated. Spray a medium casserole dish lightly with cooking spray. Add the stuffing to the dish. 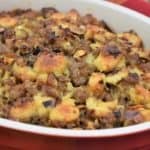 Bake the sausage stuffing for approximately 30-40 minutes until the top is a nice golden brown color, and the internal temperature reaches 165°F. The cooking time will depend on the size of the casserole dish; the thicker the layer of stuffing, the longer the cooking time will be. If you’re using a large casserole dish, cut the cooking time – check it after 20-25 minutes and gauge the remaining cooking time from there. 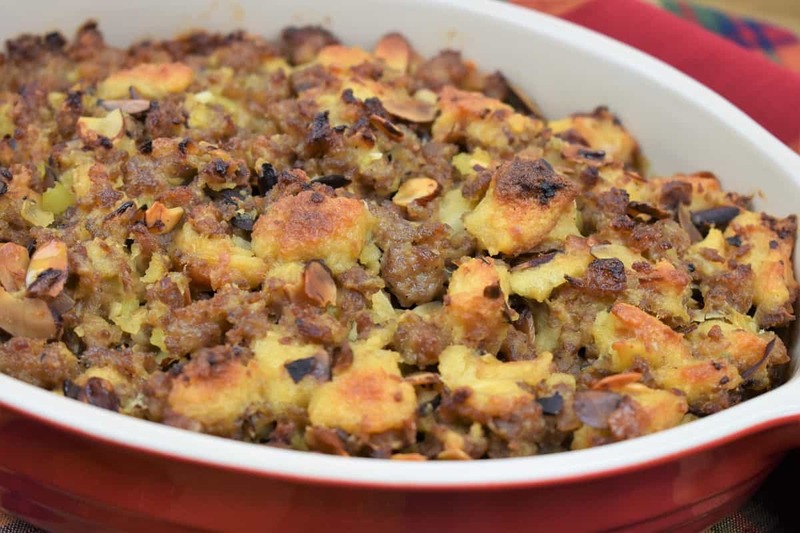 This sausage stuffing is a family favorite. It’s really easy to make and uses simple ingredients. Add the garlic, cook for 1 minute, stirring frequently. Raise the heat to medium-high and add the sausage. Cook, about 5 minutes to brown the sausage, stirring frequently and breaking up any large pieces with a wooden spoon or spatula. 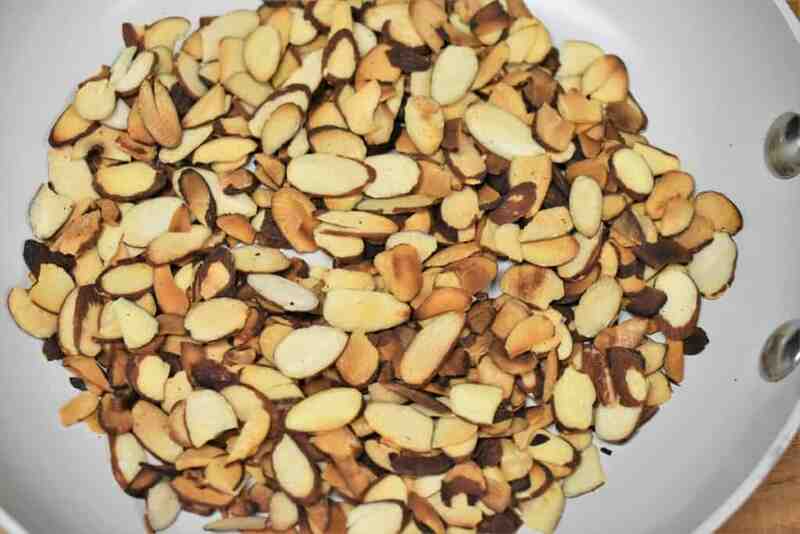 Lower the heat to medium-low and add the sliced almonds, stir to combine. Continue cooking for 3-4 minutes while stirring. Remove the sausage mixture from the heat,allow it to cool. 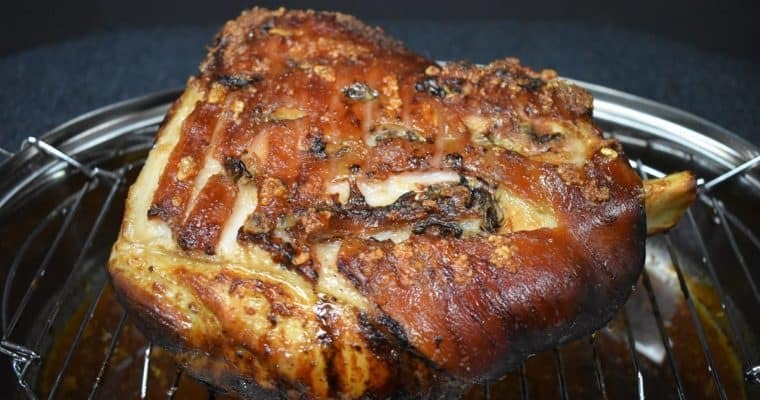 Bake the sausage stuffing for approximately 30-40 minutes until the top is a nice golden brown color, and the internal temperature reaches 165°F. 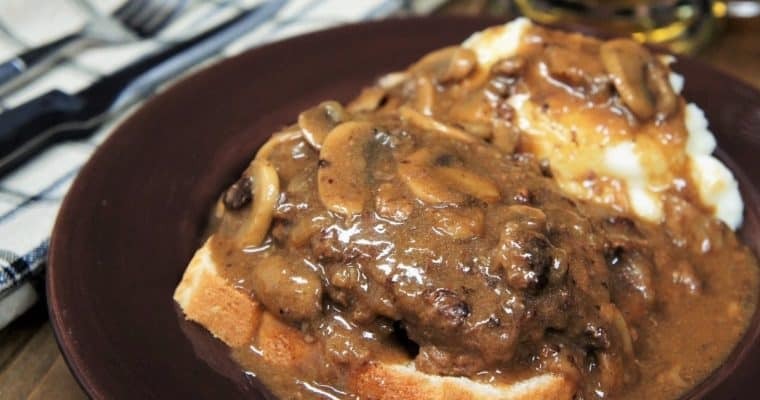 The cooking time will depend on the size of the casserole dish; the thicker the layer of stuffing, the longer the cooking time will be. If you’re using a large casserole dish, cut the cooking time – check it after 20-25 minutes and gauge the remaining cooking time from there.